Fleur-de-lis is translated from French as ‘flower of the lily,’ though widely thought to be a stylized version of the species Iris pseudacorus. The fleur-de-lis can be both decorative and symbolic. Though different cultures have interpreted its meaning in varying ways, the symbol has consistently been used as a royal emblem. 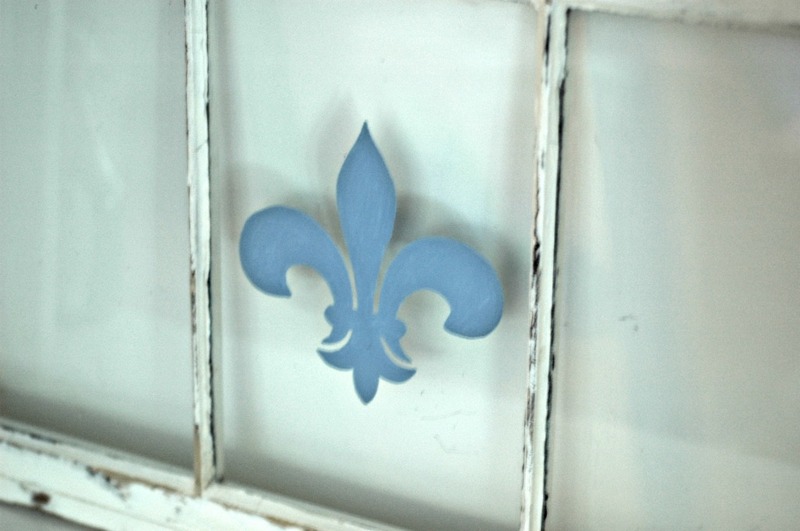 A blue fleur-de-lis is meant to portray truth and loyalty. Speaking of loyalty, I painted an old window for one of my oldest and dearest friends. To her, the fleur-de-lis means one thing and one thing only: New Orleans. She has had a love affair with the French-founded city for many years now and makes her way there at least once a year. Having just settled into a new home, I thought a little “NOLA love” might bring some peace and happiness to her and her children. 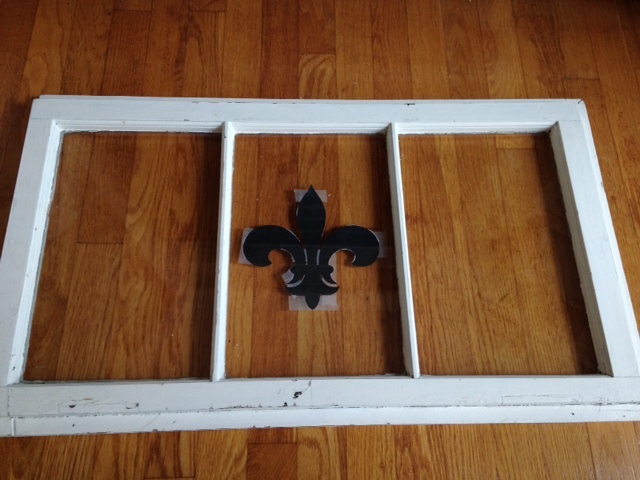 To me, the fleur-de-lis is a clean and sophisticated addition to furniture and home decor so I was pretty excited to get started. Compared with some of the other projects I have taken on, this was pretty simple and straightforward. In fact it was so simple that at times I felt like I was forgetting something! When I acquired the window, it had already been painted white and was in decent shape. 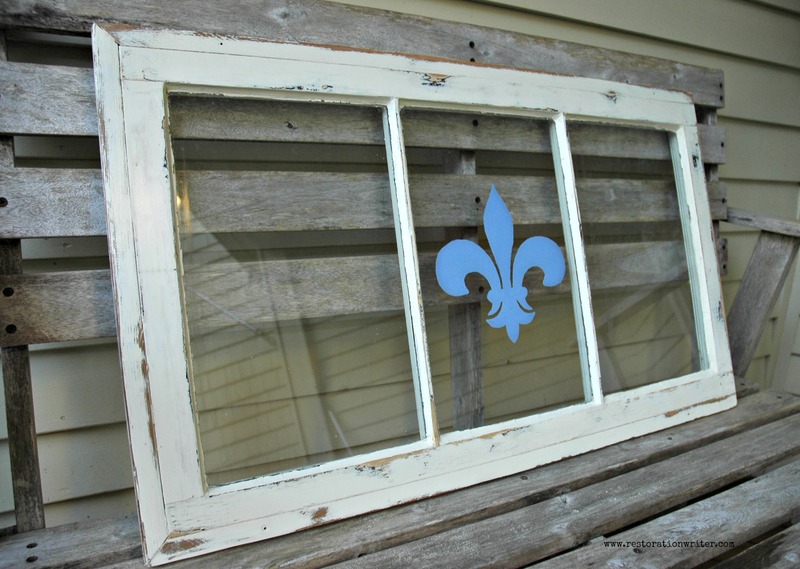 I distressed the paint with a sanding sponge and scraped excess paint from the window panes with a putty knife. The glazing had chipped off in a few places but I felt like that added to the authenticity of the distressed look so I didn’t repair the glaze. I cleaned the paint/wood with warm water and a tiny bit of dish soap and then wiped it with a damp cloth. I allowed the window to dry for a full day before adding a coat of Minwax paste finishing wax with a rag. Once the wax had dried for about 15 minutes, I buffed it off with a clean rag, buffing in small circles. 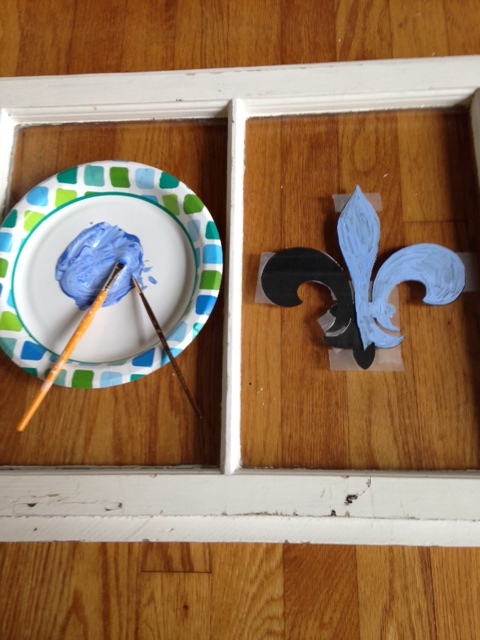 I mixed white and blue acrylic paint on a paper plate to get the French blue shade for the fleur-de-lis. I applied 2 coats of paint to the window pane with an artist’s brush and touched up any spots that were still opaque. I allowed it to dry overnight and then sealed it with a clear acrylic paint sealer called Liquitex Gloss Medium & Varnish. I chose to paint the image on the back side of the window to protect it. This way, the front of the window can easily be cleaned without risking the image being damaged. Expect to see more fleurs-de-lis (yes, that’s the correct pluralization) coming your way as I believe they are my new obsession.